Several users have reported an issue in which their Mac gets stuck or freezes (becomes unresponsive) during the installation or configuration of an OS X update. 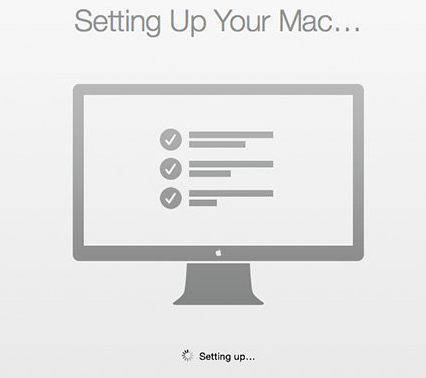 Users have stated that software update went smoothly until the Mac was stuck on the “Setting up your Mac…” screen at boot for a very long time. If you experience this problem during setup startup and can’t continue, this article offers tips on how to fix this problem. You Mac may get stuck when a problem occurs with the OS X update that prevents the computer from booting up successfully. Resetting the SMC is done slightly differently depending on the type of Mac you have. I have mac book pro of 2012.when i downloaded yosemite and tried to install the yosemite on mac all process goes well .But. in setup when i enter my apple id,the welcome page comes and once again i have entered the my apple id and again welcome .It is repeating like a loop.I amnot being able to go further step in setup.I am tried of entering apple id. Please ,help me………. Steve Jobs, Steve Jobs!!! Why have you forsaken us!!?? My macbook pro 2012 has stuck for more than one day while updating I know how to come out of this but I don’t want to stop its updation. Please tell me how much maximum time could it take? Or what should I do? Set up new MacBook Pro stops & will not allow into account, when I enter password. Trying to wifi transfer MacBook 10.6.8 and Pro is stuck in mountain screen. No icons available. Tried off/on. Tried shift/option/control/option shut down. Thank you! Pressing the Ctrl + Shift + Option + Power buttons worked for me on 1st attempt during the installation of OS X Yosemite. When the computer restarted, installation resumed from the iCloud sign-in step. Power button is in the back of the screen, on the left hand corner. My iMac was stuck on “setting up your Mac” screen, I pressed Fn+control+option+Power button for a few seconds and it worked! Thank you very much I just applied your instructions and it’s worked with my mac .. Thanks! It was really helpful. I was worried after resetting my iMac to OS Yosemite 10.10 as this setting up your mac screen was stuck for a long time. But I switched off my iMac and removed power cable for 15 seconds same you have mentioned. Its working like a new iMac now. Had this problem when installing High Sierra. Fix worked. Thanks! Thank you so much. Enormous help. The unplugging from wall essential. The shift+control+option with the power button worked for my MAC probook. Thanks so much. Thanks, my MacBook Pro came back to life ??? My MacBook pro (late 2013) got stuck at “Setting up your Mac” screen (completely unresponsive) while being updated to Moja e (the update went smoothly before that) and your tip worked. Anyway, I don’t understand why the System Management Controller (SMC) was faulty.